FICEP pioneered and patented (US Patent #7974719) not just the scribing technology but also the importation of geometric data directly from a CAD file so the scribing locations and part number data of intersecting detail elements does not need to be programmed manually. 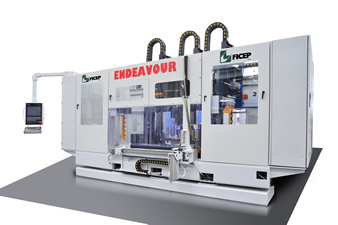 Since the invention of this technolgy FICEP has added this capability to all of their CNC drilling and punching lines for structural steel and plate. Typically the requirement for the generation of scribing data occurs on all four sides of the member to eliminate costly manual layout and location errors. The FICEP 1203 DDS CNC scribing system generates unbelievable productivity as it is the only CNC layout system on the market that can automatically generate scribing on all four surfaces simultaneously! The FICEP system positions the section to the appropriate general location along the conveyor line and then each of the four scribing units move independently with their sub axis without any scribing limitations to the other devices as they all move independent to each other. As this technology incorporates a marking head for each surface it is not necessary to lose time moving the market device from one surface to the next.